More than half of the world’s raptor species have declining populations and nearly 20% are threatened with extinction. The need to monitor raptors and understand the threats they face is therefore as pressing now as ever. The Global Raptor Impact Network (GRIN) was created by expanding the African Raptor DataBank globally and combining it with The Peregrine Fund’s Global Raptor Information Network—all in an effort to monitor and conserve the world’s raptors. GRIN gives raptor researchers tools to more efficiently conduct their own studies while contributing to a global program. GRIN also provides citizen scientists a way to participate in raptor science and conservation. The database of raptor sightings held by GRIN (the GRIN DataBank) already approaches 200,000 entries, thanks largely to help from raptor researchers, bird-watchers, and bird atlassing projects. 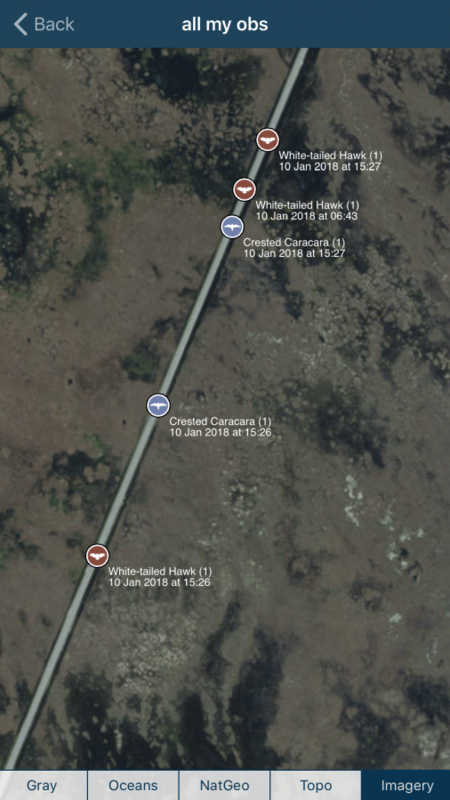 It is designed to use all different types of raptor observations, from road counts, foot transects, and static count data through to satellite tracks, mortality incidents, and museum data. The GRIN DataBank is coordinated through The Peregrine Fund and managed by Habitat Info. In the 1990s, scientists noticed that populations of many raptors across Africa seemed to be in decline, yet there was no way to assess the contraction of their ranges, identify their strongholds, or track their threats across the continent. Habitat Info, The Peregrine Fund, and other partners developed the African Raptor DataBank, or ARDB, to address these issues. The White-headed Vulture was uplisted to Critically Endangered on IUCN’s Red List in part based on the ARDB. Spatial mapping revealed alarming contrasts in viable habitat from historical data mapping. From October 2011, the ARDB engaged raptor researchers across Africa over a five-year period to collect real-time observations that enabled accurate estimation of range size and distribution of raptors across the continent, the same criteria used by IUCN to assess extinction risk. 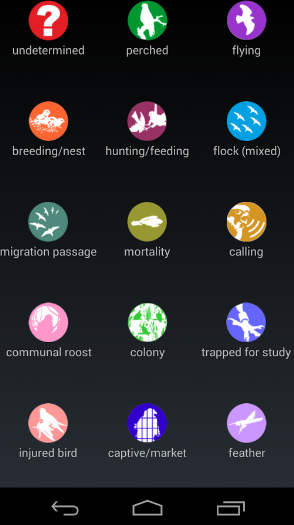 Contemporary data points were collected through a smartphone app in partnership with Eckerstrom Consulting, the UN Convention on the Conservation of Migratory Species (Raptors MoU), and dozens of scientific and conservation groups across the continent. Historical data were also entered by digitizing atlases to compare real-time data against published data. Using over 180,000 data points within the ARDB, scientists calculated the striking amount of habitat lost since 1978, mapped hotspots of threats such as poisoning and electrocution, and identified sites with the best habitat for each raptor species. 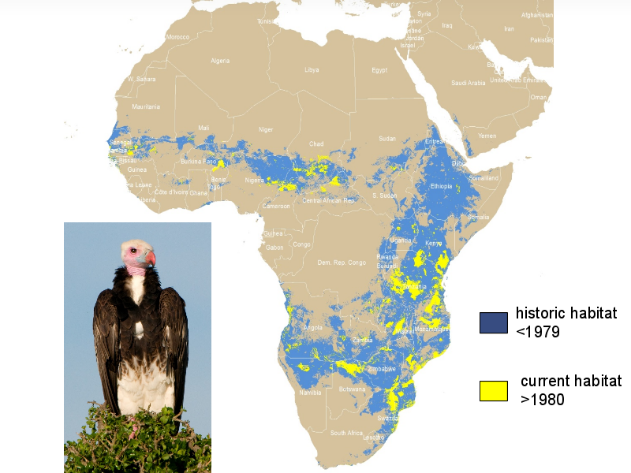 These results contributed significantly to the uplisting of six African vultures on IUCN’s Red List. The ARDB brought together the individual efforts of raptor researchers and citizen scientists across the continent to prioritize species for management, identify habitats that need to be protected, and determine where threats are most acute. GRIN builds off of this success by taking the ARDB global while adding breadth and depth to the methods of data collection, storage, and analysis. The GRIN Smartphone App is COMING SOON. 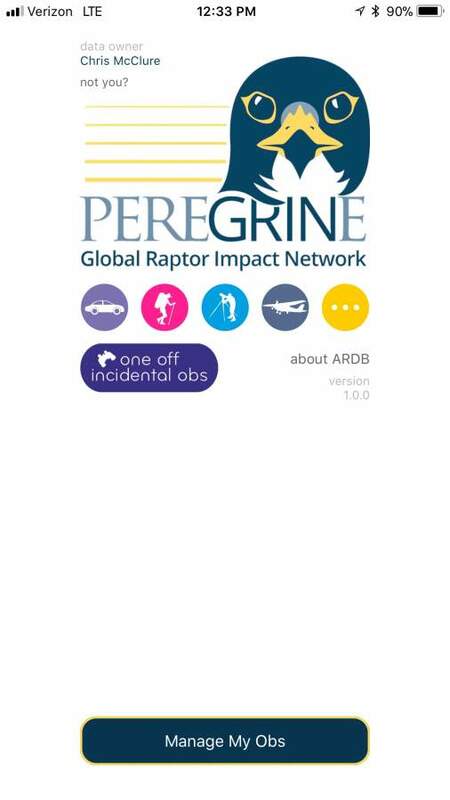 Available for Android and iOS devices, the GRIN app is a free tool that allows professional and citizen scientists to collect raptor data on their mobile device. Observations including sightings, nest productivity, mortality, resightings, museum specimens, etc. can be collected using the GRIN app. Thus, raptor researchers can conduct studies directly in the field with their mobile devices, removing the need for tedious data entry once they’re home or in the office. The speed and scale of the threats facing raptors require a global monitoring effort that can keep pace with a rapidly changing world. Your records will help us keep a finger on the pulse of the world’s raptor populations while also identifying threats to raptors and the conservation actions needed. Raptors need space, and your observations will also help us measure the amount of habitat being used and left available for each species. Currently, only the users who input the data and The Peregrine Fund’s researchers have access to the GRIN DataBank. In other words, if you enter data, only you and The Peregrine Fund will have access to it. The Peregrine Fund will establish agreements with data owners that specify the extended use of each dataset. Further, if your data constitute > 10% of the data used in an analysis, you are guaranteed co-authorship in any publication resulting from that analysis. So, there is no risk of getting ‘scooped’ when you enter your data into the GRIN DataBank. We plan to implement data visualizations that might include showing locations of sightings on maps. Raptor data can be sensitive and thus sometimes should not be made public. Thus we will take special care not to post, map, or share data regarding the locations of sensitive species or nest sites. Users can also mark any observation as ‘confidential’ to ensure that location will not be made public. 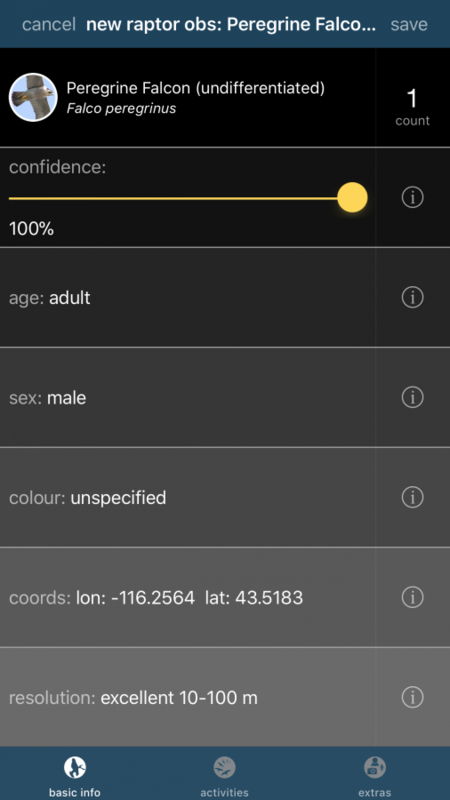 We are currently working to mobilize old datasets and can help with yours. Just send us an email at GRIN@peregrinefund.org and let us know you’d like your data uploaded to the GRIN DataBank. We will be providing simple-to-use proforma spreadsheets that may be filled in with sightings data or nest observation data and then simply dragged onto a webmap to synchronise the data with GRIN. What About the Old GRIN Website? It’s still there! None of the content from the old website has been lost. We hope to soon re-vamp the GRIN website to merge the old content with the new DataBank, stay tuned!